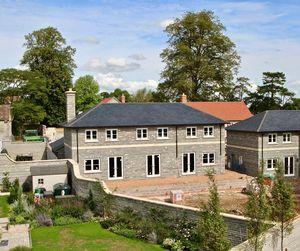 A brand new Blue Lias stone built four bedroom detached house with double garage and walled garden enjoying a delightful setting on a private development in the grounds of an historic manor house. Viewing is highly recommended to appreciate all that it has to offer. 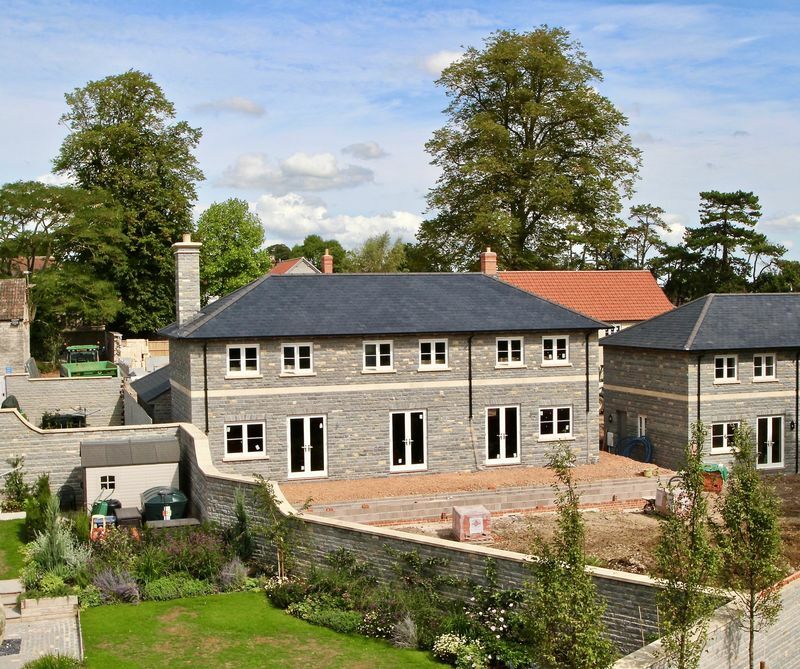 A most attractive brand new detached house presenting Blue Lias stone elevations with traditional architectural details including Bath Stone window cills, a course of Bath Stone below the first floor windows, fascia boards supported by decorative brackets and a semi circular entrance porch with a lead roof. The accommodation is well proportioned and beautifully appointed with underfloor heating throughout the ground floor, oak doors to all rooms, a spacious lounge with French doors onto a large south facing paved terrace, and bath stone fireplace with wood burner. The large kitchen is fitted with Kensington Haze units including an island unit and built in/integrated appliances. French doors open from the kitchen onto the terrace and a wide opening leads to the dining room also with French doors onto the terrace, imbuing both rooms with a light and spacious atmosphere. 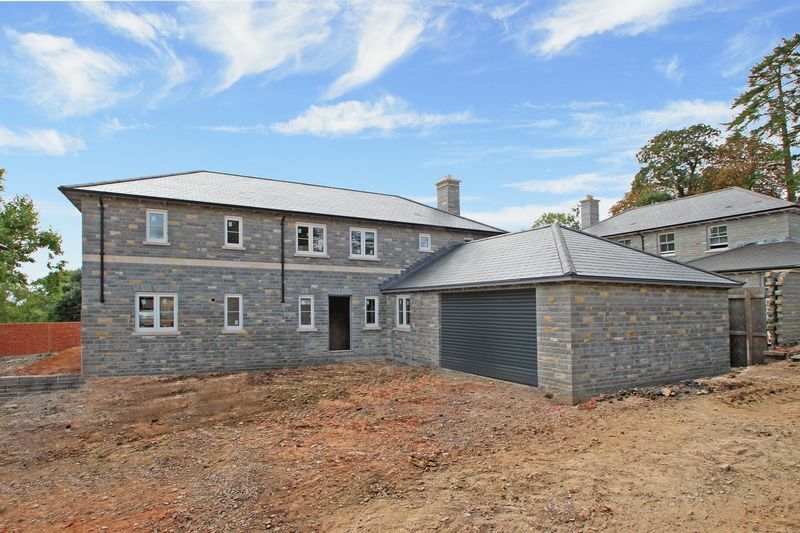 A separate utility room is provided with a side entrance door opening onto a secure gated access leading to the walled garden which will be turfed prior to sale completion. 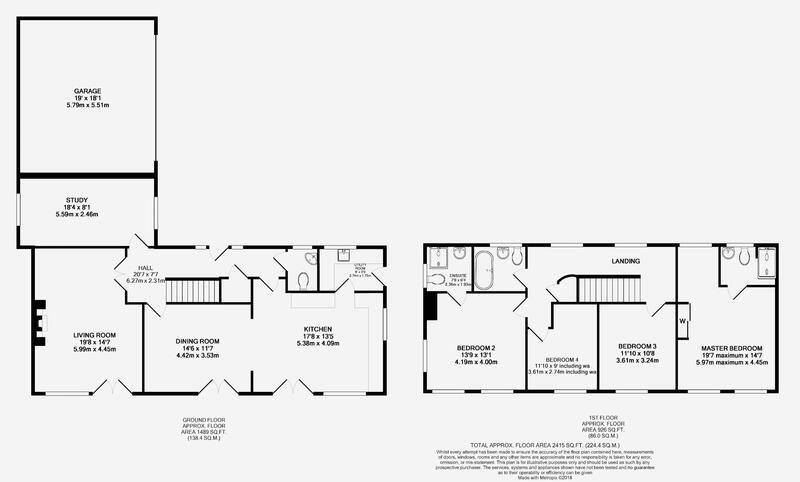 A large study adds desirable extra space to the ground floor. On the first floor the landing features two windows and includes a laundry cupboard. 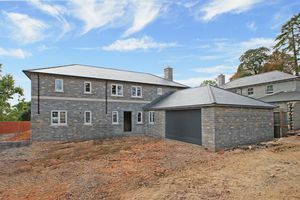 The bedrooms are all spacious with the master bedroom and guest bedroom situated at opposite ends of the house both with the benefit of ensuite shower rooms. The sanitary ware throughout the house is white with contemporary tiling from Porcelanosa. A security alarm system is installed. The property is set in a landscaped walled garden with a flagstone style paved terrace, turfed lawns and mature specimen trees. 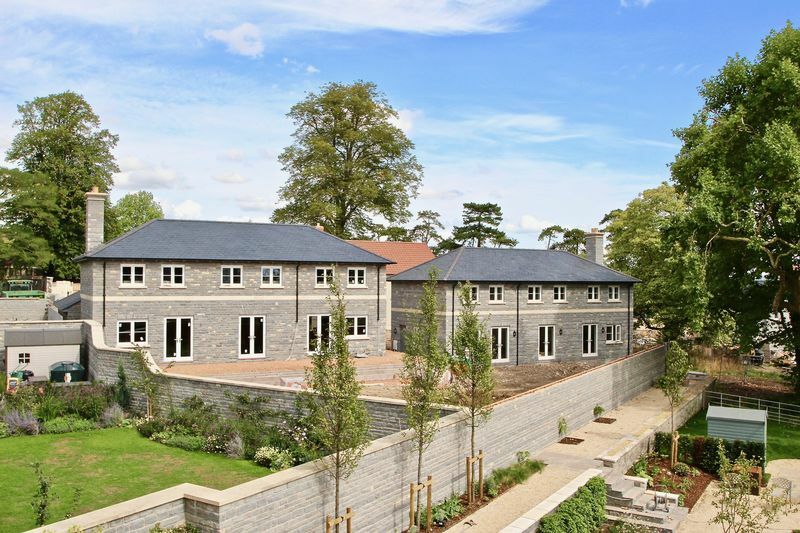 A driveway provides ample parking in front of the double garage which has the benefit of power and light. From the driveway a paved pathway leads directly to the property and a gate at the side of the house leads to the rear garden. Kingsdon is a favoured village located in South Somerset. The amenities include a community run shop, village hall, allotments, recreation field, cricket field and popular gastropub the Kingsdon Inn. The market town of Somerton is just 3 miles away offering excellent facilities to include a supermarket, shops, doctor’s surgery, pharmacy, post office, a choice of pubs, bistros and restaurants. 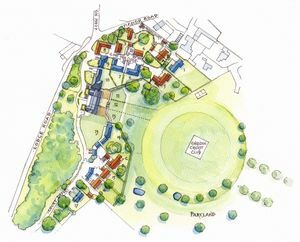 Other nearby places include Street the home of Clarks Village and Millfield, the historic towns of Glastonbury, Sherborne and Yeovil providing shopping and business facilities. Local private schools include Millfield School in Street, Kings School Bruton, Bruton School for Girls, Sherborne Girls, Sherborne Boys, Hazlegrove Prep in Sparkford, Queens Taunton, Kings Taunton, Sexeys School in Bruton and Wells Cathedral School. Charlton Mackrell C of E Primary School and Huish Episcopi Academy just rated one of the Top 10 schools in Somerset are within the catchment for state schooling. 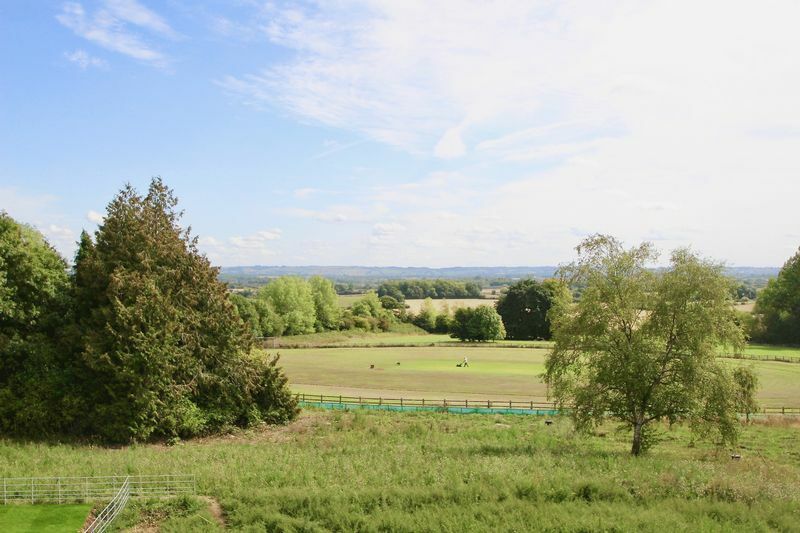 Set amidst glorious countryside yet is only five minutes drive of the A303 Podimore Junction enabling good access to the Home Counties and west to Devon and Cornwall. The Dorset coast is also easily accessible being within an hours drive. From Street follow the B3151 for approximately 7 miles passing Somerton. Take the second left turn for Kingsdon at the bottom of the hill into Lodge Road. Bear right and the site entrance will be found on the right hand side. From the A303: at the Podimore roundabout take the exit onto the A372 signposted Langport and Somerton. Take the second right onto the B3151. Take the next right into Lodge Road. Bear right and the site entrance will be found on the right hand side.